Orders of Jazz Arranging Techniques through the website are limited to 9 books at a time. If you would like to order more than 9 copies of Jazz Arranging Techniques, please visit the F.A.Q page for information regarding shipping and quantities. Click here for the PDF and Audio resources for the book. Theories of balance and blend are provided with multiple recordings and scores.The most unique feature in Jazz Arranging Techniques is the way in which the many techniques are examined and applied. Over fifty scoring examples and four complete arrangements with recordings provide a wealth of material supporting the techniques examined in the text. Parts notation for rhythm-section is covered in great detail as well as methods of articulating horn lines, adjusting the balance and blend, amongst other valuable idiomatic instrument techniques. PDF and Audio format to facilitate learning the principles discussed in the book. Click here to access these resources! 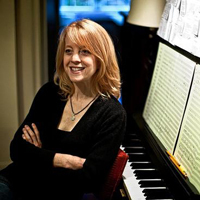 “Gary Lindsay’s Jazz Arranging Techniques fills a very big hole in educational material on arranging. I’ll never forget the day that the light FINALLY went on for me about writing closed and drop-2 voicings as I sat in Gary’s arranging class many years ago. Gary has a knack for making ‘seemingly’ mysterious things very accessible. Leaving no stone unturned, his book covers advanced voicing techniques of all kinds going in depth on everything from upper structure triads to quartal voicings and clusters. Gary makes clear the often confusing task of notating for rhythm section. The PC/Mac CD Rom includes audio tracks of the examples and scores in the book plus PDF files of all the homework assignments. 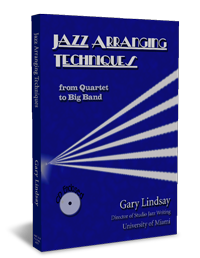 Gary Lindsay has come up with a comprehensive text that covers all pertinent information pertaining to arranging for various size jazz ensembles… Jazz Arranging Techniques is one of the most comprehensive books on the subject. It really is a cool book. 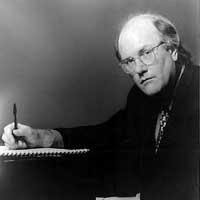 Professor Gary Lindsay is an arranger/composer, performer, educator and author. His degrees include a bachelors in Music Education from the University of Rhode Island and a Master’s Degree in Jazz Performance from the University of Miami where he is a full-time professor. As an arranger and composer, Gary has worked with Maynard Ferguson, Michael Brecker, Pat Metheny, Jose Feliciano, Natalie Cole, Gloria Estefan, Arturo Sandoval, The Florida Philharmonic, The Airmen of Note, The South Florida Jazz Orchestra, The Atlantean Driftwood Band, The Miami Saxophone Quartet, etc. 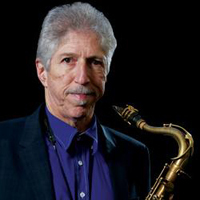 Gary composes, arranges and performs on Alto saxophone with the Miami Saxophone Quartet and the South Florida Jazz Orchestra. He is a recipient of a National Endowment for the Arts award, a Chamber Music America grant from the Doris Duke Foundation and received a Grammy nomination in arranging for “Cherokee” from the Arturo Sandoval CD I Remember Clifford.